Captain Ralph Delph boasted an angling and guiding resume that few can approach. A fisherman since age 5, he worked as a structural engineer in the 1960s and 70s, but still found time to chase fish from Miami to the Keys. He co-founded the Miami Sportfishing Club in 1965 whose members regularly competed to catch the largest fish on the lightest line. In 1967, Delph won the prestigious Master Angler award in the Metropolitan South Florida Fishing Tournament (MET) and, two years later, became the first to repeat the title. In the early 1970s, a downturn in the construction industry led him to relocate to Key West and become a full-time guide. He enjoyed huge success-- winning the MET's Guide Achievement award for 20 consecutive years for guiding more clients to Master Angler titles than any other captain in history. Delph was first to guide more than 100 clients to IGFA world record catches, which earned him the IGFA Lifetime Achievement Award in 2008. He notched a career total of 296 world records as well as numerous tournament wins. 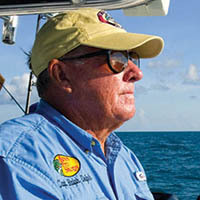 “Knowledge, experience, hard work and the adherence to the rules of sport fishing have been the foundation on which I have built my reputation,” Delph said. He mastered wreck, reef, bluewater, flats and inshore fishing. He developed tackle and techniques for fighting giant bluefin tuna on stand-up gear and worked with tackle, boat and motor manufacturers to develop innovations still employed today. He passed away in 2016, but the family fishing business continues to thrive under his sons, Captains Billy and Rob Delph.